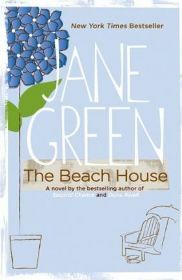 I have read and enjoyed quite a few books by Jane Green so I was well pleased when I picked up The Beach House for only ten pence at a school Christmas Fair. It was, like her others, an enjoyable read, although it did take me quite a while to really get into it. When I did though, I read the second half within about twenty four hours as I could hardly put it down! The book is about a group of quite different and disparate people who all find themselves at the same beach house in Nantucket one summer. They are all at a point in their lives where crisis seems to be looming and a break from everyday life is just what they all need. The beach house, which is in need of much repair, is owned by Nan, an old lady who’s husband committed suicide many years ago. She has kept on the house even though she can hardly afford to maintain it but she is determined not to sell to any of the hard edged property developers who seem to be constantly sniffing at her door. In a last ditch attempt to keep the house on, she decides to let out some of the rooms for the summer. Daniel, who is just coming out of an unhappy marriage, is first to arrive. It is not his wife Bee’s fault that he has been so unhappy, but the fact that he has never been true to his real feelings. Now, he is trying to cause Bee least pain but also find a way of remaining a father to his two daughters as well as living the life that he wants. Next to arrive is Daff. Her husband has left her and is now living with another woman while she struggles to bring up her difficult teenage daughter Jess. Jess has decided that she wants to spend some time with her father which provides a break for Daff and the chance to rediscover herself. Finally there is Michael, Nan’s son, who is running away from a disastrous affair with his married boss, if she would only leave him alone. He is also frustrated that he always seems to fall for the wrong kind of woman for him and this is yet another example of things ending badly. They all need a bit of respite from everyday life and Nan and Windermere (the house) provide welcome relief. Before long, they are all confiding in this wise old lady and lapping up the advice that she gives freely. When Jess turns up, the old lady really seems to relate to her and gets to the heart of what might be troubling her. She is a fantastic character and it is through her that all the different characters’ stories become entwined. The other characters are all very good too and Jane Green has created a collection of people that you just want to read about. All of the different story lines are fascinating too. As a reader, I found myself caught up in all that was going on. The stories are all about relationships – how they work and sometimes how they don’t – and that is always fascinating to me. As the story progressed all the different stories merged to create new ones. However, there were one or two quite extreme coincidences which I did feel were just that little too far fetched and that did slightly annoy me. Otherwise though, I found The Beach House an extremely readable and enjoyable book, with a gentle and relaxed style that was quite therapeutic. I would definitely recommend it to any Jane Green fans. One Comment on "The Beach House"
10p?! A steal for sure – I am a Jane Green fan and did like this book although it was not my favorite of her books.